The pump and paddle are not great. You probably want to consider upgrading after a while. I am not usually prone to hyperbole, but readers of SUPBoardGuide.com would know that there is something of a chemistry between the Solstice Bali and me. I have talked about the board in a couple of my previous posts. One thing I can definitely say is that this board is leading the inflatable revolution in the SUP world. It is changing perceptions and enabling more and more people to try out the sport because of its economical price point. If you’re looking for a cheap beginner SUP that’s inflatable this one is for you. I am quite excited about reviewing the Solstice Bali. So, let’s get started without any further ado. Many boarders now view the Bali as the go-to board if you want to try the inflatable variety; and not without reason. 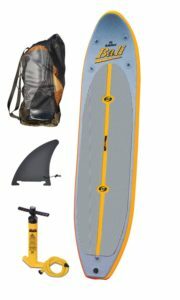 The board is created from 1000 Denier 3-ply PVC-reinforced fabric material. What this translates into is a super-stable SUP that feels just as good as a hardwood board on the water. When inflated to the appropriate PSI, it can even outperform some of the more premium boards available. Reviewers have been impressed with the board’s hard, slick feel and so have I. Continuing on the quality of its make, the Bali’s high-pressure drop stitch construction makes the board almost indestructible on the water. The inflatable SUP may only be 10 feet 8 inches, but it can tackle rough waters and unruly waves like the pro boards. I wish to caution that it is not a miracle worker, and rookies must be aware of risky conditions. The Bali, however, will maximize your skill sets as a paddler, enhancing balance and comfort like no other board in that price range. 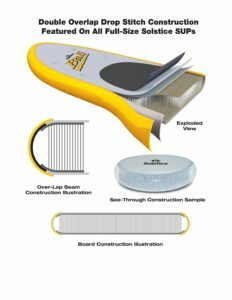 Now this is something that any paddle boarder would love to hear…the Solstice Bali is perhaps one of the easiest boards to handle and maintain. It is easy to forget that the SUP experience extends beyond the waters as well. You need to care and look after your board to get the best out of it. I had done an earlier piece on storage, which you can check out. The point I want to get across is that transporting and maintaining a SUP is an important part of the experience. It is also something that could drive away potential SUP enthusiasts. That’s why the Solstice Bali can be an ideal board if you are looking for something that is easy to handle. The maintenance and care of the board are limited to two things: inflating it to the proper pressure, and then drying and deflating it. Once you pull the air out of the board, simply roll, then slide it into the backpack. That’s about it. Even seasoned pros like myself find it hard to resist this simplicity. The Bali provides an easy alternative to fixing rails on your car and finding a dry, cool spot in your home for storage. They say don’t judge a book by its over, but the Solstice Bali makes it really hard not to. You will probably fall in love with the board at first sight, as many have. The color templates used are a stylish grey and vibrant orange, which gives the board a cheerful, happy look. The board’s name is embossed in a bright yellow, instantly grabbing your attention and setting the mood. The board’s bottom portion is covered in orange, providing a stark contrast to the mellow colors on top. The look and design of the board will tempt you to take it out every single day. And why shouldn’t you…When you have a SUP looking this gorgeous, you probably want to show it off every chance you get. The stunning looks of the Bali may distract you from the multiple features the board offers. This is one case where beauty is matched with brains. One board that can perform multiple tasks. The Solstice Bali can sometimes feel that it has been put together after listening to the many wishes and prayers of the SUP community. I have already talked about its sturdy construction, lightweight nature, and easy handling. This bestows the board with a range of benefits. 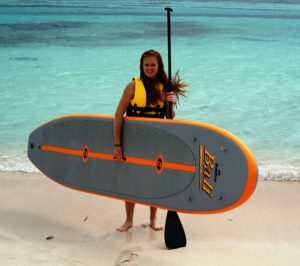 First, it can be used by anyone: right from first timers to seasoned paddle-boarders. The rookies will find it strong and sturdy enough to find their balance while the experts will love how the board tackles challenging conditions. You could also spend many hours on the board, taking in the warm sunshine with minimal foot fatigue. The board is fitted with four stainless steel tie downs that can secure your gear, or you could use them to carry some food, snacks, and drinks. Your dog could join you on the board as well without any worries of turning over. The Bali can take a maximum load of 250 pounds. Perhaps the most prominent benefit is that you can take the board to different SUP locations without having to worry about transportation. The Solstice Bali offers great value for money; however, there are areas where it can improve. The accessories provided is certainly one of them. The hand pump that comes with the board does just about an average job of filling the board up. This is the most crucial aspect of an inflatable SUP, and the results are a bit disappointing. It could take a while, and even then, the pressure may be a bit off the mark. You are way better off investing in a separate hand pump that will make the task an easy one. This is one of the drawbacks you have to deal with in this price range. More expensive boards like the iRocker or Ride by Red Paddle Co offer way better pumps but are more pricey as well. 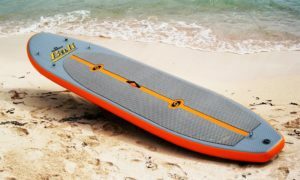 The Solstice Bali is probably the best inflatable board available for under $500. It can be the perfect first board that will allow you to get a feel for SUP. It’s perfect if you want to try out SUP without breaking the bank or if you’re looking for a cheap board next to your hardboard to take with you when you travel. At this price, you really can’t go wrong with the Bali, but if you’re looking to spend a little more, there is always the iRocker to check out. A 9 star rating doesn’t make sense. That’s way too high. The Ride has 9.5 stars and the Bali 9? Doesn’t make sense. you have to keep in mind the price point. The Red Paddle Co Ride is obviously the better board. It comes at a way higher price as well though. The Bali is just over $400 while the Ride will set you back around $1300. Comparing those boards without keeping the price in mind doesn’t make sense and that’s why I always factor it into my star rating. Hi there, I’m intrigued with the inflatable SUPboard’s price. Would you recommend it to a beginner like me? Hi Johanna. 100% 🙂 It’s a great board for beginners. Hello! I have been searching and searching and questioning and questioning, but still can’t seem to pick an isup. I am getting one for 99.9% yoga in my pool (occasionally a lake). I am getting an inflatable, but never been on one. The only thing I’m looking for is to make sure the board can fit me and my yoga practice (I am 5’3″). I know there are boards made just for yoga, but they seem to be more expensive, and it seems like there are tons of other boards that will be just fine for me. Any help or suggestions would be amazing! Hi Joanna. You’re right, some of the Yoga SUPs are super expensive. Why don’t you check out the Ten Toes Weekender? It’s 10′ long and 30″ wide which makes it great for Yoga. It also comes in a bunch of different colors and is really reasonably priced. You can either check it out here or read my review here. And for surf purpose, is it good ? Can you recommend a better air pump? Maybe one that plugs into the cigarette lighter of my car? I tried the Sevylor 12V pump. It broke the first time I used it so definitely don’t buy that one! I’ve heard good things about the Bravo BP 12 though but haven’t used it myself. I have one of these and I do not regret buying it. It is perfect to me, as a amateur. The pump it not good, but it is ok. The paddle is not bad. 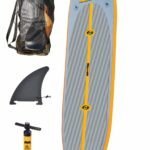 I’m looking for best value in a high quality ‘all-rounder’ that is fast, but also surfs (10′ w/rocker in the front) Tower Adventurer 2 keeps popping up, anything else better for around the same price point? Check out the 2018 iRocker All Around. It’s definitely better than the Tower. You won’t be able to surf any big waves on an all-rounder, especially on an inflatable but this board is fun to play around with in small-medium waves. It’s also in the same price range as the Tower but comes with better accessories.